"Blue Belle" is built in light alloy and is the result of work by a team made up of Cor D. Rover, to whom she owes her external lines, Isabelle Blanchere, in charge of interior design and Sydac for hull design and structures. It has two 2,285 HP MTU engines, thanks to which "Blue Belle" reaches a top sailing speed of 21 knots with autonomy adequate for transatlantic sailing. "Blue Belle's" interiors include a large saloon with adjacent dining area, on the main deck the owner's suite with its own office, on the upper deck a sitting room astern of the wheel area, four spacious double cabins on the lower deck, of which two have double beds and the other two have twin beds. There are four cabins for the crew, of which one is for the master and then three twin cabins for the sailors. All cabins are independent and positioned to ensure privacy for the owner and his guests. On the deck "Blue Belle" has loads of space dedicated to relaxation and accessories such as a spacious solarium, bar, dining area and Jacuzzi, all situated on the large sundeck. The cockpit is furnished with a table for open air dining and is sheltered enough to be used when sailing. For further information please contact Mondomarine, Lungomare Matteotti 6; 17100 Savona; tel. 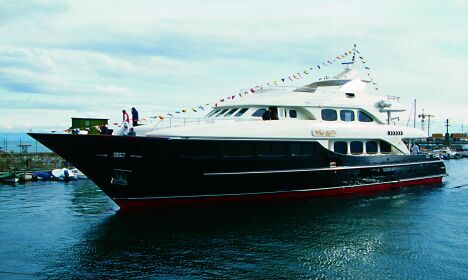 019 828516; fax 019 823418; website www.mondomarine.it; e-mail campanellaspa@campanellaspa.com.